Holiday time or not, these homemade stuffing recipes (or is it homemade dressing recipes?) are easy to prepare and delicious and vary according to your taste buds. USE FRESH HERBS. I cannot stress that enough. These will soon become a family tradition after your family tastes these. Honest. Add your own touches and make it yours. You will learn how to make stuffing the old fashioned way. PREHEAT oven to 350 degrees. Spread the white (or whole wheat) bread cubes in a single layer on a large baking sheet. Bake for 5 to 7 minutes in the preheated oven, or until evenly toasted. Transfer toasted bread cubes to a large bowl and go from there. First we are going to make the broth. In a saucepan, add 8 cups of water with the gizzards and neck of the turkey. Add the Better Than Bouillon Turkey or Chicken base. Bring to a boil and simmer for 30 minutes; remove from heat. I mince the cooked gizzards and neck meat and sprinkle over the dried bread cubes. Meanwhile, melt butter or margarine in a skillet over medium heat. Cook onion and celery in butter, stirring frequently. Pour cooked vegetable mixture over bread cubes in a very large mixing bowl. Season with poultry seasoning, garlic powder, onion powder, sage, salt and pepper. Add beaten eggs and toss with your hands to mix. Pour in two cups of hot broth to moisten; mix well. Stuff the turkey loosely and any leftovers, place in greased casserole dish. Not stuffing a turkey? Following are two more methods for cooking the stuffing. Transfer mixture to slow cooker, and cover with a thin kitchen towel - then cover. Cook on High for 45 minutes, then reduce heat to Low, and cook for 4 to 8 hours. Keep the broth handy and if you need to moisten it more, use the chicken broth. Transfer mixture to slow cooker, and cover with a thin kitchen towel - then cover. Transfer to a 9x13 inch greased baking dish or other large casserole dish. Bake uncovered for 45 minutes to 1 hour at 350 degrees. Check stuffing and add more broth as needed. Cover if it is getting too dark. More homemade stuffing recipes follow. In a saucepan, add 4 cups of water with the turkey giblets and neck. Add 2 teaspoons of Better than Bouillon Chicken or Turkey base, with the butter; bring mixture to a boil. Simmer for 30 minutes and remove from heat. Mince the giblets and neck meat and keep in the refrigerator until the next day. Place the broth in a container and store overnight in the refrigerator also. The flavors are better when you do this the night before. Bring out the broth and bring to a boil. Remove from the heat. 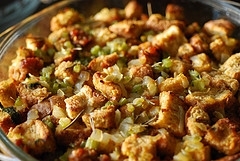 In a large skillet, cook the sausage with the onions and break up the lumps. Add the chopped celery, fresh sage, rosemary and cook for 2 to 3 minutes while stirring. 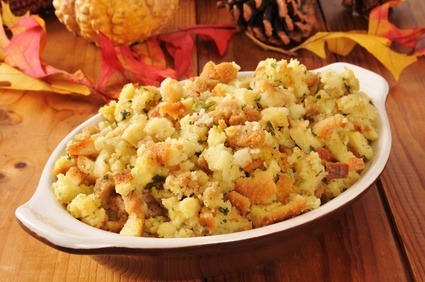 Place the stuffing cubes in a large bowl. Pour sausage mixture over the cubes and toss with two large spoons. Add the chopped parsley, apples, cranberries, minced giblets and neck meat to the cubes and mix well. Pour 1 cup of the hot broth over this mixture and toss to incorporate. Add more broth as needed to moisten the cubes. Stuff the turkey. If you are going to bake this - spray a dish with vegetable oil, cover and bake for 30 minutes in a 350 degree oven. Uncover and mix well; adding more broth if needed. Bake uncovered for another 15 to 20 minutes. Combine the crumbs and seasonings. Melt the butter and add the onion and celery; cooking until the onion is almost translucent. Toss with the crumb mixture and stir over heat for a few minutes. Loosely stuff the bird. For Oyster Stuffing add a little oyster liquid and 12 large oysters, coarsely chopped. This homemade stuffing recipe is excellent for turkey or duck. Delicious. Soak the bread crumbs in the milk. Soften the butter. Mix all of the ingredients together and mix well. Two cups of boiled chopped chestnuts may be used in place of the almonds.